The madness continues... But wait there's more. It took me a little over one thousand days to post my first project so I figure this is way ahead of schedule. I spotted Shipwright’s post earlier this week and thought this would be a fun project for a Friday afternoon. The cost of materials is negligible, although it has demonstrated that it is time for a new digital camera so the project will be more costly than expected. I probably spent as much time getting the first two photos as I did at the lathe. The box is made from a scrap of pegwood, a short wooden dowel that is sharpened and then used to clean pivot holes in clocks and watches. Sources theorize that the dowels are cut from either dogwood or orange wood. Since I didn’t do anything interesting with veneer (perhaps I should have tried a segmented turning) I decided to put something inside the box. This was made from a scrap of brass and was modeled after a grail shaped beacon. I used a 0.026” drill to hollow out the box and a 0.015” bit to open the bowl of the grail. For those who like work in progress photos, I have included the two least awful pictures. One is of the box, taken while I was shaping the lid. The other is of the grail, taken right before I parted it from the brass stock. I’m sorta kinda dumb-struck here. The “thump” you heard was my jaw hitting the floor. Amazing bit of work Troy. Let me guess, you needed a break from turning pivots. Wow – that is amazing. I have to wonder how you kept from sneezing at the wrong time and what you made that giant penny out of! Both box and grail are hollow, this is the easy part. I have drill bits down to 0.1mm. Pivots are boring and turning brass is just too much fun. You’ve caught me, I have a 3 foot diameter penny that I save for occasions like this. Sneezing wasn’t a problem but the grail did separate earlier than expected when I was parting it off from the stock. I spent almost as much time searching the floor for the stupid thing as I did turning it. This is known as working on the big bench. Kind words, I hate to shatter the illusion of skilled craftsmanship but this was really pretty easy and is certainly within reach of anyone with modest turning skills and an Optivisor. table on that lathe, this is indeed skilled craftsmanship. Thank you for sharing. I did the work on my Moseley watchmaker’s lathe, a Christmas gift from my parents, it has remained my favorite WW type lathe. The lathe does have a compound slide that I use on rare occasions, for me it is much quicker and easier to cut free hand. For metalwork my main work horse is an 8” Habegger (same as Schaublin 102) here I rarely use the T rest. 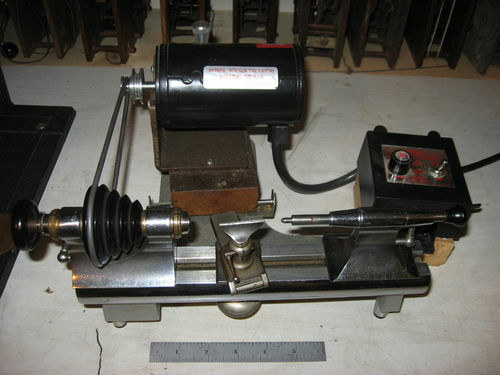 I would love a Hardinge but am sufficiently invested in Schaublin type tooling that switching is unlikely, unless I stumble across a well equipped Hardinge at a giveaway price. The small lathe is not necessary for this project, just more comfortable, I could have done the work on my Jet midi lathe. Turnings like these can be done on most any lathe as long as you have collets. The stock I was using was 1/8” to 3/16” dia., collets of this size are available for virtually any lathe on the market. Turning small parts requires that your hands and face are far too close to the work to safely using a 3 or 4 jaw chuck. Hello. You probably know that I’m the nutcase that started this all off. Troy, I’m so sorry I missed this when all the madness was going on. Can you give me and idea of the outside dimensions of your work. It may yet be the smallest! If so I need to update my original post. Thanks (I think) for starting all this, the project was fun and I may be considering another attempt. At least the cost of materials is reasonable and cleanup is a snap. The box is 0.061” dia at the base and 0.045” at the top. The total height with lid on is 0.106”. The grail is 0.025” dia and 0.038” tall. Since I went through the same “treasure hunt” during my version of this project, I certainly understand the part about trying to find the piece that you dropped. Congratulations on being the new title holder!!!! !